Grace to you and peace! Good Sabbath! 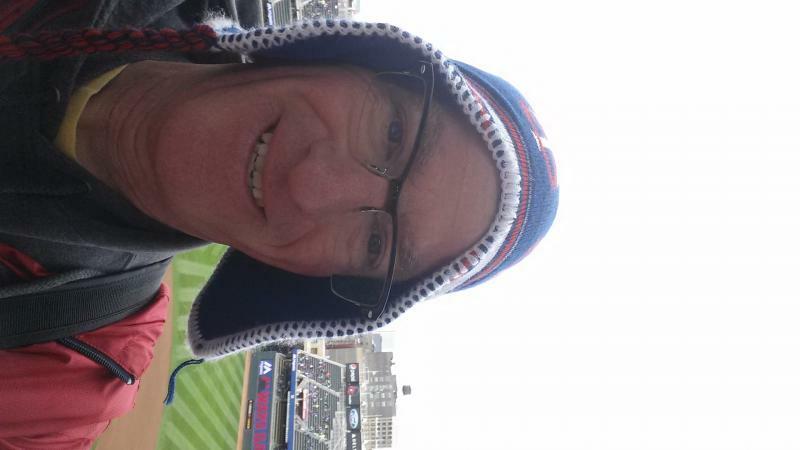 While I am on Sabbatical I will use this page to share my experiences with you. This will be a unique experience. I am honored to be given the opportunity, the time, and the trust to take it. The Apostle Paul say that we are the body of Christ, "if one member is honored, all rejoice together with it." (1 Corinthians 12:26) I do hope that you will rejoice with me through this time. Thank you! It has finally arrived. We were ready, with a few "to does" left. Lydia had one last day of school, to keep her busy before the excitement. At 4:00 PM we headed to the airport and waited 3 hours for our flight. The biggest excitement so far was a mouse at the airport running around under the heating ducts. On the plane at 10 PM we settled in to watch movies, (Julie recommends Philomena, a story with powerful themes of forgiveness), and try to get a little sleep. By noon we are landing in London, meeting Sophie and are on our way. From the airport we took the train to Victoria Station and walked a few blocks to our hotel, EasyHotel Victoria. The rooms are small and bare and barely enough, but cheap for central London. We knew that even though we were tired we couldn't go to sleep so we headed out for a walk, past Buckingham Palace, through St. James Park and to Trafalgar Square. We would easily get our 10,000 steps a day in, averaging 8-10 miles of walking a day. We ate at a place call The Silver Cross which advertised "traditional pub food." It was good, but later we ate a place that advertised the same way and discovered they had the exact same menu. We wandered around Trafalgar Square. Lydia, Julie and I took a bus back to the hotel and collapsed at 8 PM. We used cash to pay for our tickets which must have been unusual since it took a while for the driver to figure out the fare. Austin and Sophie walked back since Sophie had been in Europe for a month, so did not have jet lag and Austin was Austin. In London, Paris, Florence and Rome we had Museum Passes which allowed us free entry and the ability to skip long lines. We used the Pass today to visit the Tower of London to see the Crown Jewels. I wonder if the Queen ever says, "I want to wear my crown today. Bring it from the Tower." I suspect not. 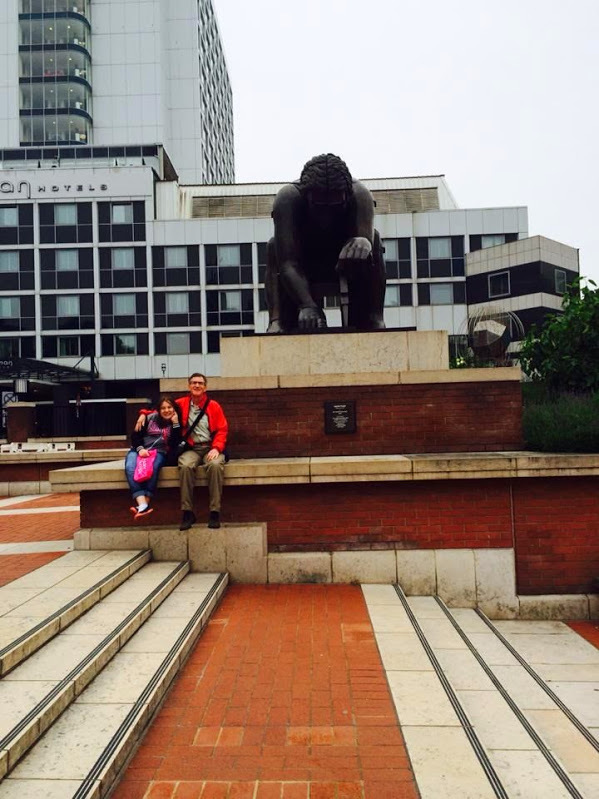 ﻿ Today we visited two of the major stops I wanted to see in London: The British Library and the British Museum. At the Library I saw two memorable pages from illuminated manuscripts. One showed Jesus praying in Gethsemane beholding a vision of the crucifixion. The other was a woodcut depicting Adam and Eve being tempted, while God was peeking through the clouds watching the whole event. I also got a kick out of listening to the Beatles Song "Help" while reading the lyrics off the paper it was written on; it sounded a prayer. Listen to it that way and pray. 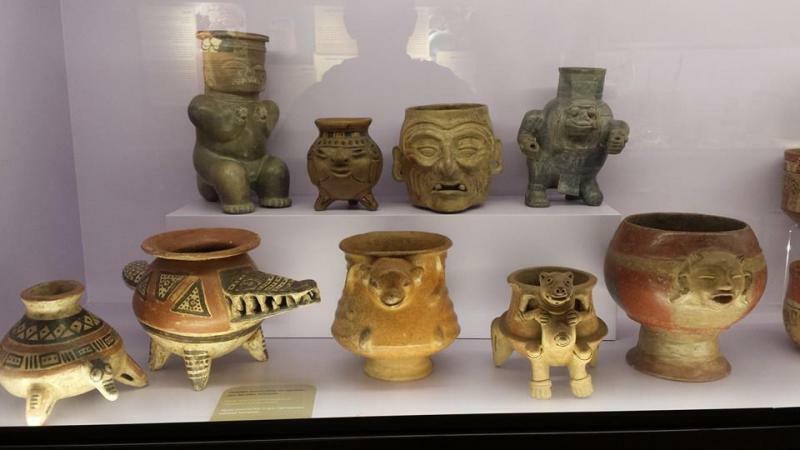 We went to the British Museum. Austin spent the whole day there, though the day was interupted by a fire alarm and we had to evacuate the building. Lots of people staying calm and clearing the building. 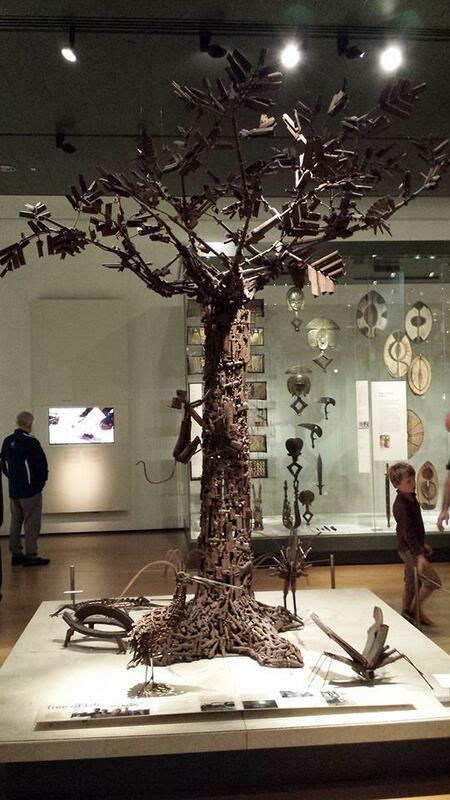 I stumbled upon two powerful pieces in the African part of the museum titled Throne of Weapons and Tree of Life, sculptures made out of guns and shell casings. I'll say more about these someday when the sermon is from Isaiah, "they shall beat their swords in plowshares." The girls were less interested in the Museum so Julie, Lydia, Sophie and I went off in search of Charles Dickens home, another one of those unexpected, stumbled upon places that was so worth our time. We now want to see the movie The Invisible Woman about Dickens and his mistress. We finished off the day by going to St. Martin in the Fields for a Bach and Vivaldi By Candlelight concert. Wow! However, the day was not quite over yet. Ice cream was in order and we found a places that concocted ice cream masterpieces so good we returned again a few nights later. Oh, and Julie found a very charming waiter who flirted with her and told her leave me. Oh we laughed. After breakfast we went to see the home of George Frideric Handel, composer of The Messiah, a home that was later occupied by Jimi Hendrix, an odd pairing of musical styles. From the outside it looked like simply one house among many, but inside the rooms were his with furniture and guides in each room. In one room we were allowed to try on clothing from the period which was just plain fun. In the afternoon we returned to central London to see Westminster Abbey and the Churchill War Museum. The war museum was the underground rooms from which the British planned and fought WWII. Julie and the kids spent the rest of the afternoon there. Austin suggested that I head off on my own to the Tate Britain Art Gallery, which turned out to be a great suggestion. I walked 15 minutes to the museum and spent a good hour or so there. It's not a great art museum like the National Gallery, but it was good. It was also one of the galleries on my list. The big event of the evening was WICKED at the Apollo Victoria Theatre. We have all been looking forward to this and we were not disappointed. The story is fantastic, the music powerful, and we sat on the edge of our seats resisting the urge to sing along. 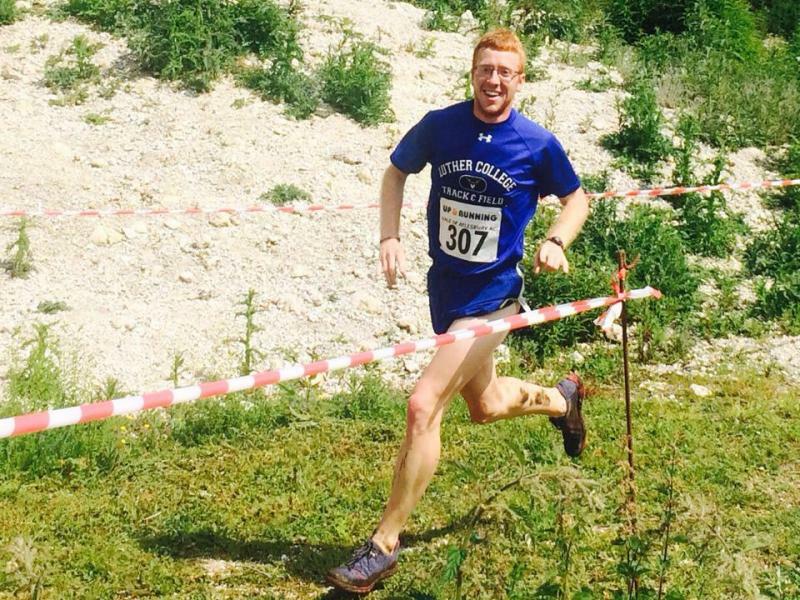 Austin wanted to run a race in Britain and found one an hour north of London. He and I rose early took the tube, then a train, then a bus and another train to Wendover and the Coombs Hill Run, 4 K. While he got ready I explored the town and found an art show at the local library. The race itself was up hill to a monument. The last part of the climb was a scramble up a muddy slope. Then down hill to the finish in a quarry. Last year they ended it in a pasture but it made the cows nervous. Austin won. First place was awarded a medallion and dinner for two at the Shoulder of Mutton Pub. Since we were there and not probably ever coming back we ate. I had Duck with cherry sauce and he had Rack of Lamb. (Not typical pub food!) All entrants in the race also recieved a half pint of beer, though everyone paid for the extra to have a full pint. While we were in Wendover the girls went to Selfridges, a department store and a show on PBS Julie watches. It was huge and expensive but fun to see. Austin and I met them late in the afternoon at the National Gallery of Art. This is a big museum filled with masterpieces. I was in awe. Everytime I turned around I saw another work that I recognized. Lydia and I ran around for a while pointing and staring, you would be surprised at how many paintings she knows. Eventually the rest caught up with us and we looked together. This was one of the big galleries I wanted to see. St. Martin in the Fields is right next to the National Gallery. We walked over and since they were inbetweem services we asked if we could use the altar space so Julie and I could renew our marriage vows. It is our 25th anniversary July 15 and 25 years ago we spent our honeymoon in Great Britain. Lydia read scripture from Song of Solomon, Austin and Sophie read the liturgy, and Sophie sang an aria filling the place with glorious music. And yes, we kissed. Dinner and ice cream and back to the Hotel. In the evenings we spend a little time at Victoria Station to utilize the WiFi. Austin and Sophie had better luck than I did uploading stuff to Facebook. We flew to Denmark in the afternoon. I sat next to anevangelical/anglican/businessman who engaged me in conversation the whole way. He was concerned about the direction the church was taking particularly on issues of homosexuality. The issues are similar throughout the church. He also took a great interest in our journey and the conversation was pleasant. In Denmark we rented a car (The car is called a Picasso, how appropriate), so I got my first expereince of driving in Europe. Adam and his girlfriend Emily met us at the airport and led the way to his home in Graestad. The main highways were very similar to American roads, but the smaller roads were narrow and had no shoulders, grass grew right up to the pavement. It was good to be out of the city, in a rural area, (Graestad is about the same size as Milaca) and in a home with family. It really was wonderful to see him again. It felt very normal. His mom had dinner for us, pulled pork and cole slaw and a wonderful dessert, some kind of cream with cookies. It was late by the time we left and Adam took us out to the resort near Blistrup about 20 miles away. On the way he got a little confused and drove around a round-about 5 times before deciding which exit to take. 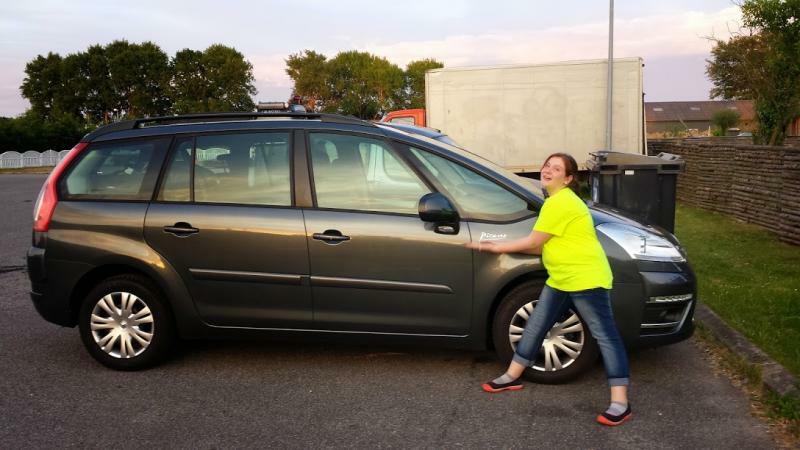 We laughed so hard it was hard to drive. At the resort the gate was open and our keys were taped to the door. At this point the only indication that we were coing had been our reservations, we had made no deposit. The room was like a condo but was set up for handicap accessibilty complete with a hospital bed and lift and an open bathroom to accomodate a wheelchair. Its big, Lydia has her own room, Julie and I have a room, and Austin and Sophie share a room on the main floor. Adam's family served us a good European breakfast, pastries, cheeses, breads, fruits, juice and coffee. Adam was still in school so while he attended class Gitte, Henrik, David and Emily took us to Fredericksborg Castle. Fredricksborg was a "Once upon a time" fairy tale castle. The gardens were immaculately cared for, every hedge trimmed and the apple trees trained to grow so the branches formed a circle. The castle itself was of course huge. It seems it has been turned into an art museum with every wall displaying paintings and every ceiling painted with some scene too. The chapel had a number of large murals of biblical scenes. Adam joined us for lunch and later gave us a tour of his school. We took everyone out to dinner in Gilleje on the coast. Of course we had fish, flounder, and it was good. Dessert was better, a creamy yogurt with berries. It was late when we got again, but this time the gates were locked. It took four of us to figure out how to use our keys to unlock and open the gate, but we did and slept well. This morning I drove into Blistrup and bought breakfast at a grocery store, danishes, cheese, apples, juice... We met Gitta, Adam's mom, and drove back to Gilleje to spend some time walking around town and see the North Sea. The area is a bit like the North Shore of Lake Superior. Austin went for a brief swim just to add another ocean to his list. We did walk around town, Julie found a Bing and Grondel Christmas plate 1926 and some sea salt. Gitta bought some bread for lunch. The next adventure was an old amusement park, "Bakken" somewhere near Copenhagen. The rollercoaster was built in the late 1800's, made of wood and quite a thrill. The older kids took a ride called "Extreme" which is the wildest amusement park ride I have ever seen. For my part I was glad that Henrik bought us small glasses and tickets for 7 samples of beer at the various vendors around the park. We ate a very traditional meal of sliced, non-smoked bacon and potatoes in a creamed parsley gravy, all you can eat, and we ate. The adventure of the evening was not over yet. Henrik guided us back to Graestad and I thought we could find our way back to Blistrup. It was dark and I was wrong. We ended up on a dead end road, we ended up in Gilleje, and finally we ended up at home. Of course the gate was locked but we knew how to get in this time. Henrik had programmed the GPS in the car to take us to the airport, but of course its not that simple. This was a problem day, not disastrous, but problematic. Problem 1 was finding a gas station, it was amazingly hard to find. Problem 2 was finding the airport because the GPS took us ingto central Copenhagen and ended directions without the airport in sight. We asked for directions which were something like, take a right and then a left and then a right and then another right and you will be at the airport, and we were. Problem 3 happened when we arrived in Berlin. The Baggage claim was right next to the off ramp from the airline and we missed it. Consequently we had to recover our baggage at the lost baggage area in another part of the airport in a place that looked like a long forgotten shed. We were not the only ones who made that mistake. The rest of the day went well. We stayed at a Holiday Inn which was nice just for the sense of familiarity. By 3 PM we were on the train to central Berlin. Austin wanted to see the Pergamon Museum and the Temple of Zeus from Miletus ﻿﻿connected to a J-term he had spent in Greece in 2013. 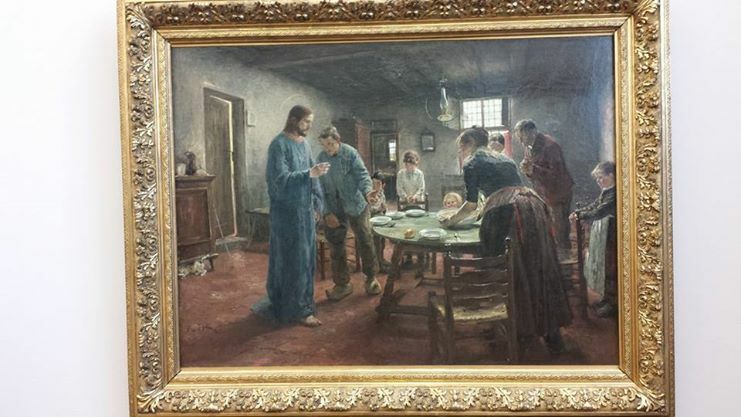 I got to the Altes Gallery where I found one particularly nice piece called "Table Grace." 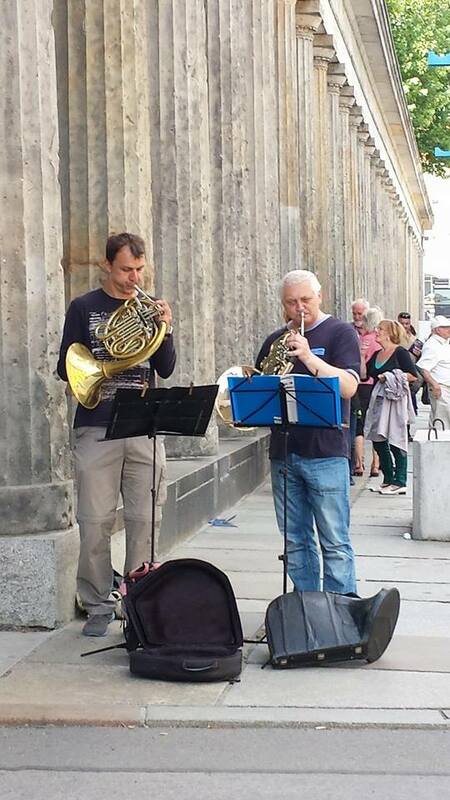 We also encountered some very good street musicians playing classical music on French Horns. We found a good Thai restaurant, "The Jolly" very good, and a Lutheran Catherdral, but it was closed, we were tired, ready for some ice cream and a return to the Hotel. Since we are in Germany we knew we needed to visit one of the WW II Concentration Camps. Sophie had been to Dachau outside of Munich earlier in her journey. The camp near Berlin is called Sachsenhausen. It was intended to be a model camp on which the other camps would be based, but they built to small. The story of the camp is told honestly and clearly. We saw the barracks, the death zone where anyone could be shot on sight, the gallows, gas chambers, hospital, and various other displays. Around the centeral area of the camp where the prisoners gathered to be counted each day was a walking track composed of various surfaces mimicing places where soldiers would march or walk. Jews wore boots to test to durability and walked the track for hour after hour after hour. I took one walk arounf the track to reflect. I do think that anyone who visits Germany should spend time at one of the camps to remember and honor the people who were captive there, who suffered and died there. Back in Berlin we quickly said good-bye to Austin who was flying out the next morning and then took a taxi to the airport. In Munich we took a train from the airport downtown to the car rental place. There we met Sarah, Lisa, Petra and Jurgen and hugged and lauighed and began a party that wouldn't end until after midnight. Oh joy what a happy reunion. 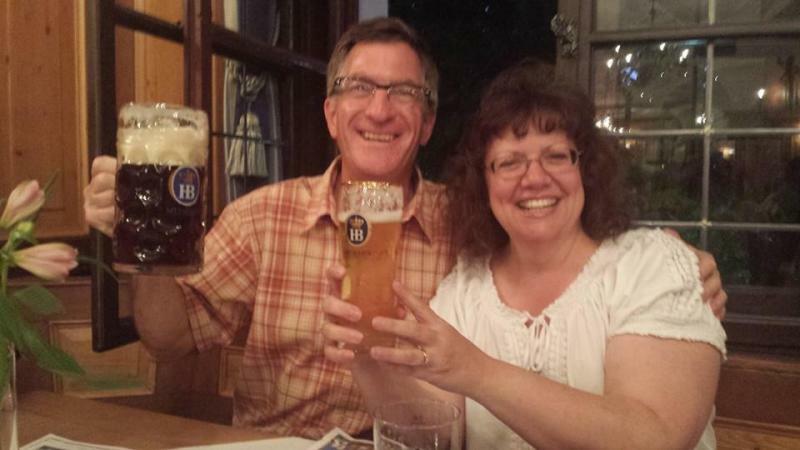 They took us first to the Hofbrau house where I drank a big beer, had white asparagus in Bernaise sauce with potatoes, yum. We talked we laughed we sang with the band we talked and we laughed some more, then the party moved to the Hotel and we talked and laughed and drank a little more until 12:30 AM. Good thing we don't have to meet them tomorrow until 10 AM. Fortunately no one is ready by 10 AM. So we were able to have a wonderful breakfast at the Hotel. By 11 or so we were on our way south into the mountains on our way to celebrate the wedding of Sarah's cousin. Lisa, Sarah, Petra and Sophie were dressed in traditional Bavarian Durndels, Jurgen also wore traditional Bavarian clothing. The church was small but beautiful. The service lasted about an hour and included congregational singing, and solists. Sophie even got to sing and play. The bride and groom sat in chairs facing the front and ended their vows by saying, "Ja, mit Gott Helfe mir." "Yes with God's help." The service as a whole was more religious than most American weddings. The whole assembly gathered outside the church for a group photo which seemed old fashioned but very nice. After the wedding we went up the mountain to the reception. Up the mountain! On a narrow winding road made for single lane traffic. The reception started with glasses of Proseco and cake, a huge cake shaped like a heart and covered in strawberries. The groom put on a leather apron and took a wooden mallet, tapped the keg and got sprayed with beer. We stayed for a long time, looking over the mountains into Austria, having a German buffet of meats, cheeses, potatoes, dumplings and breads. By 9 PM I knew we had to get off the mountain because I did not want to drive down in the dark. The GPS took us back to Munich by a different mountain road which made our mountain passes (Going to Sun Highway) seem like major highways. Again, one lane, narrow, tunnels, forests that grew up to the side of the road. I was very happy to see the autobahn and drive to Munich at 140 KPH (only about 87 MPH). We did take the Metro trains to the Arc de Triomph and the Eiffel tower. We took lots of pictures, of course. Back to the food. 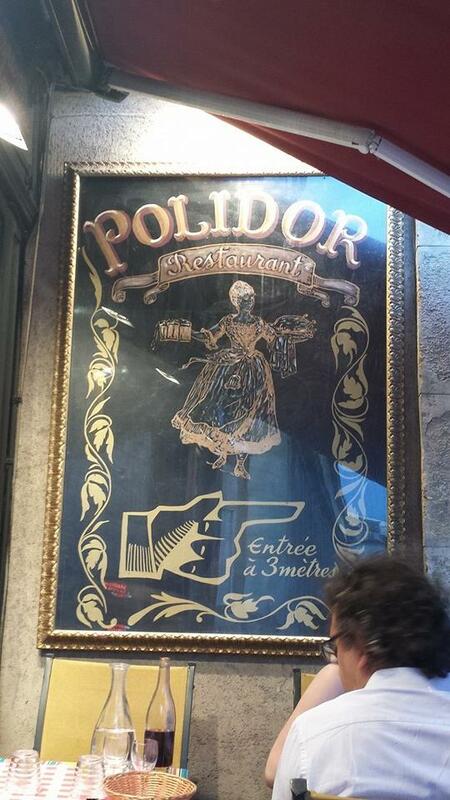 The clerk at the Hotel suggested we try the Polidor for dinner. I took a bit to find it but it was worth it. 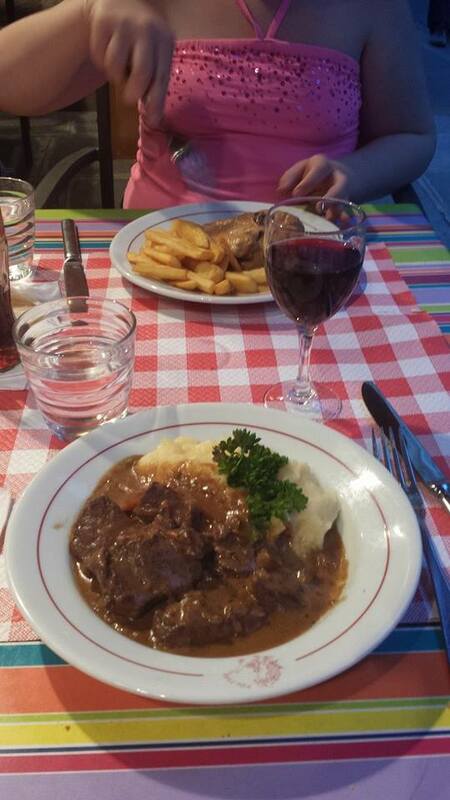 Julie and I had Boeuf Bourguignon, Lydia had chicken and Sophie had Salmon with spinach gratin which sent her into spasms of ecstasy! Julie said, "I'll have what she's having'" and "I can make that at home." We hope so! That's it. Travel days don't allow for much more. Chocolate almond croissants, apricot pastries, hot chocolate and coffee, almost made me forget my bowl of Wheaties back home. But then we went to the Chocolate Museum, (honestly I did go for the art, but the food just got better and better too.) The museum was great! Lots of samples of really good chocolate. The history of chocolate was good too. Check out the hot chocolate mugs. "The noble women of New Mexico drank so much chocolate drink that it was even served to them by their servants during mass. The bishop of San Cristobal was so exasperated and offended by this that he forebade it to be drunk during mass. But he paid the price as later he was poisoned. Another issue that came up was the consumption of cocoa drink during lent. ... (In a book dating back to 1642) it is stressed that cocoa drink, just like wine does not break the lenten fast because it is not consumed as food." Never give up chocolate for Lent! There was another good quote to that said, "There is nothing better than a good friend, except a good friend with chocolate." We tried to go to a Museum of Music but it was closed on Mondays. Sophie was quite disappointed and as she had been in Europe for over a month at this point she was really ready to fly home. 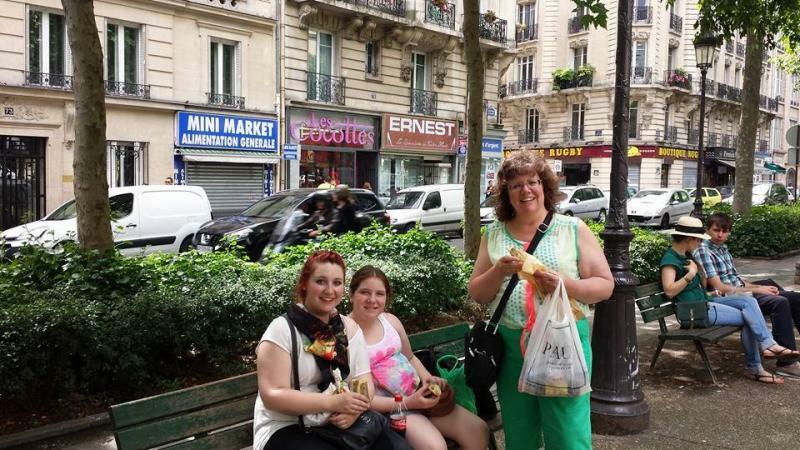 Instead we found the Moulin Rouge, (way to expensive to go eat at, and perhaps not a "Pastor" stop), so instead we bought a baggette, some cheese, fruit and something to drink and sat on a park bench for lunch. 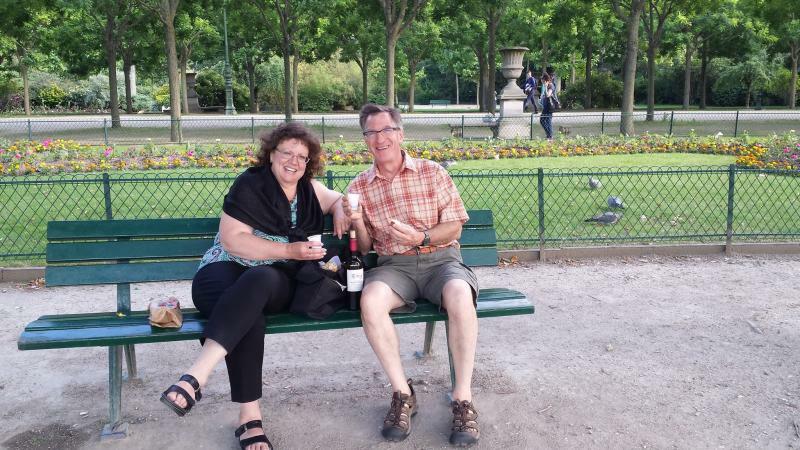 We took a Big Bus Tour of Paris in the afternoon, dinner in the evening and off to bed. It was a cloudy, rainy day. This was supposed to be the day Sophie and Lydia flew home, except we made a mistake and went to the wrong airport. By the time we arrived at the correct airport, after a long taxi ride, the gate had been closed for 15 minutes. We were able to arrange a flight for the next day but our mood was as overcast and disagreeable as the day. By the time we arrived back at the Hotel it was already late afternoon. The Hotel clerk was very understanding and kind. He said that we should have made a scene at the airport about the gate being closed because that is the only thing to which airlines respond. Bless him for his sympathy and hospitality. He also informed us that Paris would be experiencing a "planned one day transit strike," so what buses and trains were running would be infrequent and crowded. He arranged for a private transport service to pick the girls up at 6:15 the next morning and said it would be fine for them to sleep in our room that night. We made the best of an otherwise lost day. After dinner we went to the Montparnasse Tower for views of the Eiffel Tower at sunset. The tour bus description of the Montparnasse was that it was the tallest building in Paris, and the ugliest. The best thing about it was that from the tower one doesn't have to look at it but can see all the other lovely sites of Paris. The room was crowded that night and amazingly we all slept. We also set five alarms for 5:30 AM. There is no way the girls are going to miss this flight! The alarms woke us up and the girls were on their way by 6:00 AM. Julie and I were ready to go by 9, yes we both fell back to sleep. This was our first day on our own. Nortre Dame - Big, Beautiful, and so full of Art, though I nearly lost Julie in the crowd out front when I wandered off to take a picture. The Conciergerie - Actually a prison and the last stop for Marie-Anntoinette before she lost her head. We will find out more about her when we visit Versailles. Sainte-Chappelle - The most magnificent display of staineed glass windows in the world. Simply overwhelming! It would take as long to read them as it would a book, and like a book the print would be very small. We found a beautiful tapestry that we should have purchased and later did. For lunch we shopped at a little market, picked up a baguette, some cheese, some fruit, and something to drink and sat on a park bench at the Luxembourg Gardens, a very Parisian lunch. So relaxing and good. 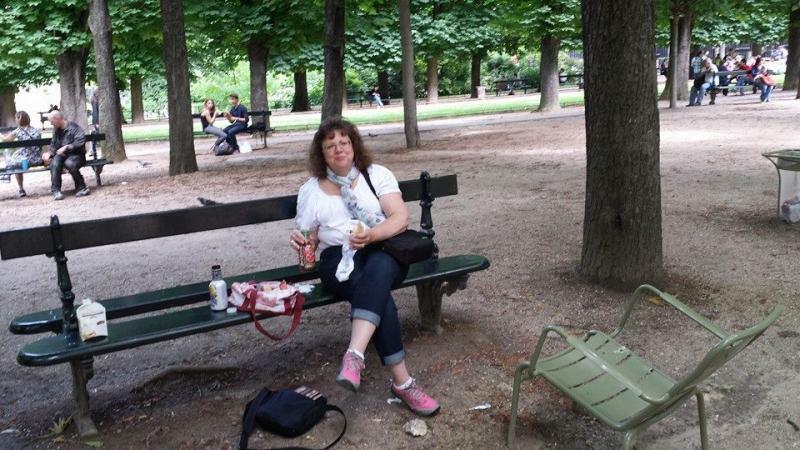 This truly is one of the delights of Paris, the relaxed lunch in the park. Later we walked around the gardens, watched children pushing boats around the pond and found a shop to buy dessert, Chocolate Eclairs. In the afternoon we walked down to the Cluny Museum of the Middle ages; Roman Baths converted into monastery, converted into art museum. This was one of the places I really wanted to see. It's prime attraction is The Lady and the Unicorn tapestries of the five senses plus one, though I also found a nice stained glass of St. Timothy. We went back to Hotel to rest in the late afternoon, as became our habit for most of the trip and around 7 we went to eat. Julie knew of a restaurant called Cafe De Flora recommended by Ina Garten. We will never forget our meals, so, so good. Big day, one site: The Palace of Versailles, the epitomy of oppulence and extravagance by the 1% of the 1%, King Louis XIV and Marie Antoinette. Wow! There were paintings, scuptures and gold everywhere, and room after room after room, not to mention tourists snapping pictures of everything. We toured the grounds which were much less crowded by taking the Petite train to the Petite Tourain (Marie's retreat palace) and Maries idealized peasant village, and the Grand Tourain (for King Louis mistresses). Napoleon also lived here for a time. The train ride home was interesting. First we went to the wrong station at Versailles (I think the strike was still on), then none of the venders would make change so we cold buy a ticket, and finally the when we went to get help they waved us on through and said they were selling tickets anymore. We did make it back to Paris and stopped at a Cafe near our Hotel. We had a bottle of wine, Entrees (Nicois Salad and French Onion Soup), and Primas (Avocado and Shrimp and Cheese Fondue). It's 10:30 by the time we get done with dinner and back to the Hotel. I sat in wonder. 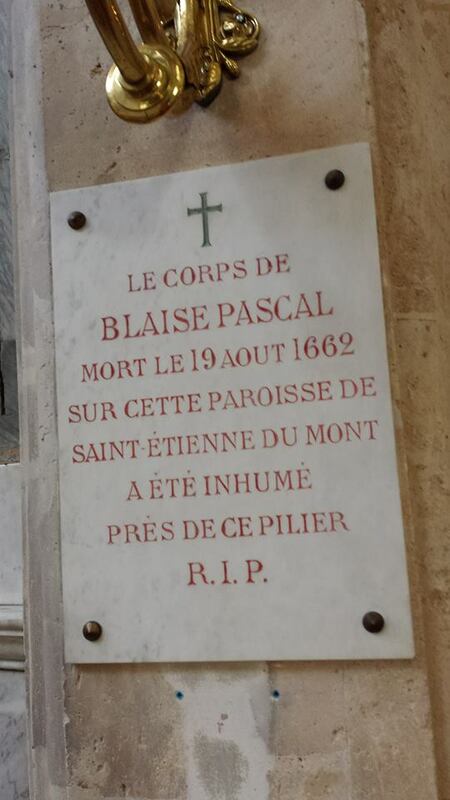 Blaise Pascal is one of my favorite philosophers and earlier in the day I had been wondering where in France he was remembered. I stumbled upon it here. Thanks be to God. In some respects the best part of this very good day was yet to come. 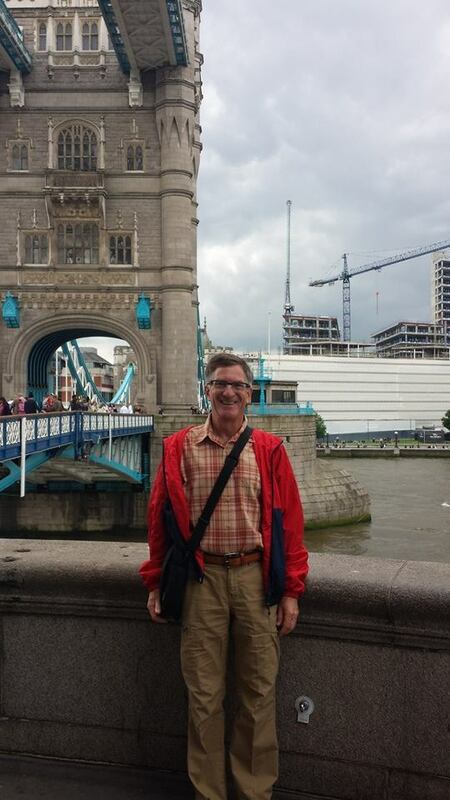 We used Rick Steves travel books throughout the planning and traveling. For Paris he suggested walking down the Rue Cler, a street of markets and small grocers, to gather a picnic for the park. 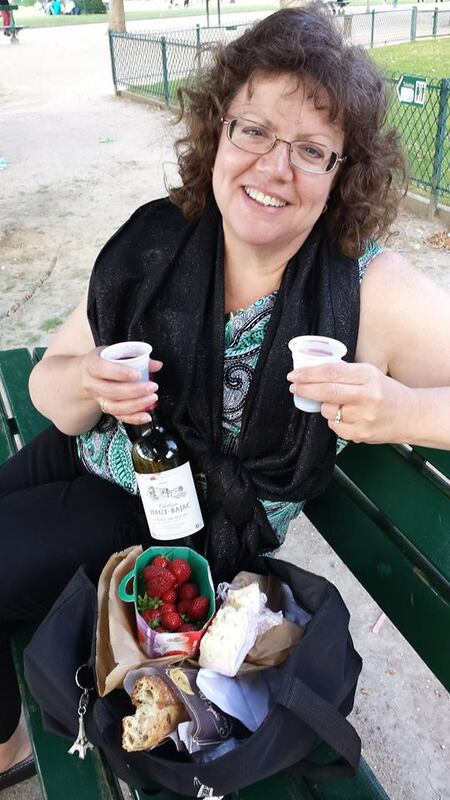 We picked up some of the most beautiful and delicious strawberries I have ever tasted, some chocolates, some bread, cheese and wine from a Fromagerie, (they even opened the bottle and provided two plasctic glasses) and then made our way to a park bench a block from the Eiffel Tower. 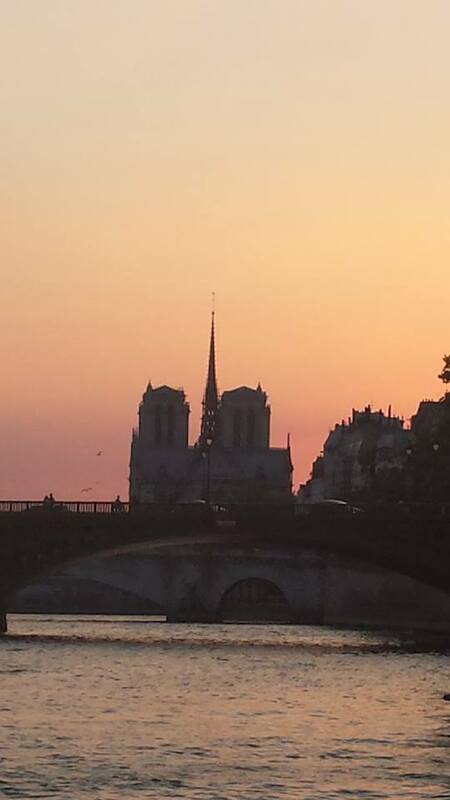 We finished the evening taking a cruise down the Seine. It was beautiful and romantic as the sun set. This really is a marvelous city. And don't believe it when people say the French are rude. We found them to be helpful, polite and kind. Our flight for Florence did not depart until late afternoon so we still had one day to explore. One thing we had to do was return to Saint Chapelle to pick up the tapestry. We took it back the Hotel and it barely fit in the suitcase. Oh well, mission accomplished and it quite nice. The last museum I wanted to see was the Orsay. Its works are from the style of Impressionism and include Manet, Monet, Tissot and others. The age was a transition from religiously commissioned pieces to artists freely expressing what they themselves wanted to paint. The rest of the day was spent in transit. We arrived in Florence around 8:30 PM, took a taxi to the Europa Hotel and were sent off to a very nice restaurant near San Lorenzo Church. From the room we had a good view of the Duomo (Cathedral) and Campenielle (Bell Tower). We slept in until 8, though the church bells rang at 7, and the bed was hard as the floor, so we feel ... rested? We intended to go to the Duomo for worship, (why not worship at the big church), but we turned right instead of going straight and ended up at San Lorenzo instead for the 11 AM service. It was in Italian and mostly spoken, but we figured out that it was Trinity Sunday and followed the traditional liturgy very well. My argument for knowing traditional liturgy is that one can go anywhere and regardless of the language still follow and worship. We recognized the Gloria, the scriptures, the Nicene Creed, the prayers and Lord's Prayer and the Communion liturgy. Music was provided by a small group with a guitar. We recognized the tune for an Alleluia and another tune from "Jesus Christ Superstar." No, I could not follow the sermon. After church we discovered that it was market day in the streets. Everything was for sale, and as we learned the same things were for sale all week as the marketplace moved around town. Italians are very good at sales so we parted with a few Euros and broguht home some souvenirs and gifts. After lunch and a little rest at the Hotel we walked around town orienting ourselves for the days ahead. We found the Duomo, the Pont Vecchio (a bridge with expensive gold and jewelry shops), and a nice walk by the Arno River. We had a nice long dinner (2 hours), Julie had alfredo and I had gnocchi, and wine. The next day required an early start so we needed to try to sleep on the hard beds. 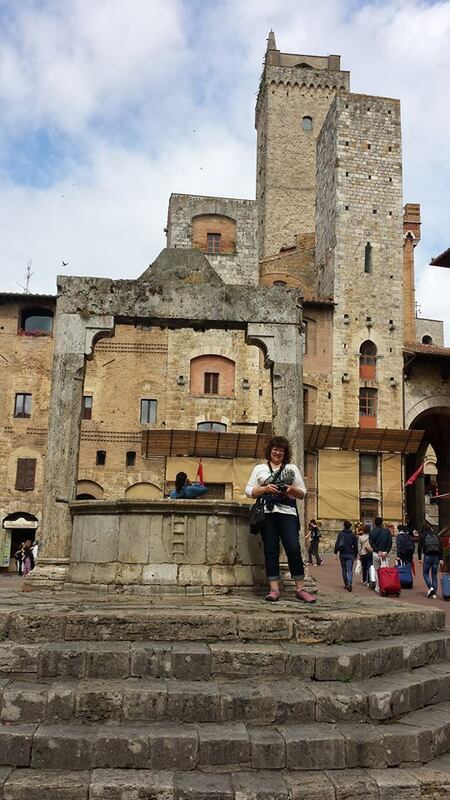 We boarded a bus for a day tour of Tuscany that would take us to San Gimignano, wine tasting at a vineyard, Siena and a hilltop fortress, Monteriggioni. San Gimniignano is a World Heritage Site because of its well preserved tower houses. The town is so well preserved because in the 1500's the plague devastated the populace and though probably never sat empty it also was never developed any further. We found a nice museum and church. Some of the frescoes in the church were damaged during WWII. They covered the side walls telling the bibilical story through the Old Testament on one wall and the life of Christ on the other. Frescoes are painting done in wet plaster and before stained glass windows became popular they functioned as the way to adorn the church and retell the story fo faith. 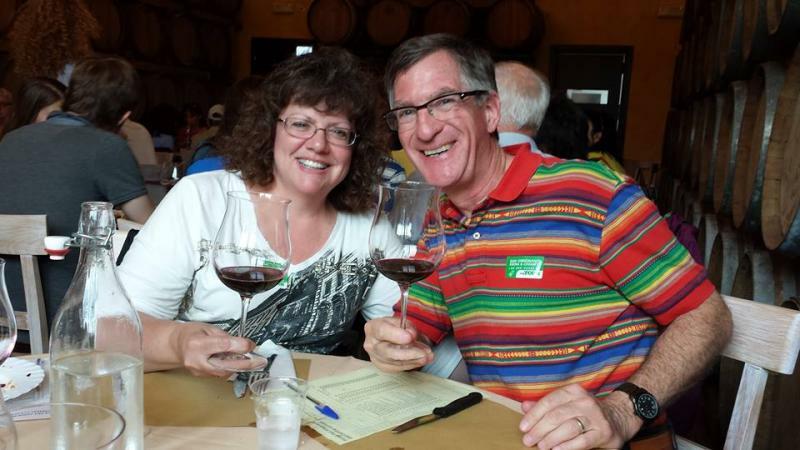 The Next stop was the vineyard fro wine tasting,Tenuta Torciano Winery and Vineyards. It was great fun. We sampled 8 wines, 30 year old Balsmic Vinegar, and had lunch. We also learned about wine glass size, the correct way to pick up a glass and the process of drinking the wine. At one point volunteers were asked for so of course I volunteered us. We helped introduce the dessert wine. From there we went to Siena where the first stop was for Gelatto. (We stop for Gelatto [ice cream] almost every day!) To see Siena we followed a guide on a walking tour. It was too long and involved to much detail on topics we were not that interested in. Eventually we broke off from the tour but by that time there was not much time left to explore. We saw some sites but didn't get to enter them. 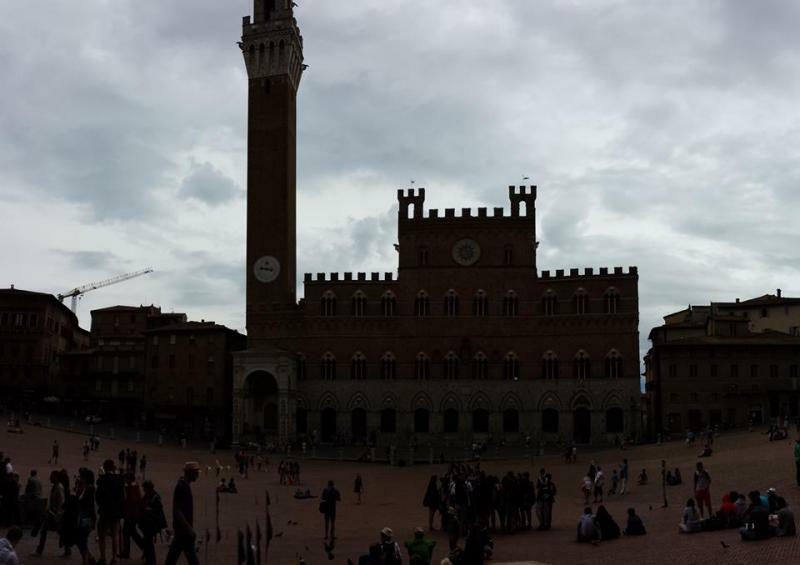 We were tired so we went back to the Piazza del Campo, a large open paved square where there is an annual horse race. Its a great place to sit. Some people call it the beach. 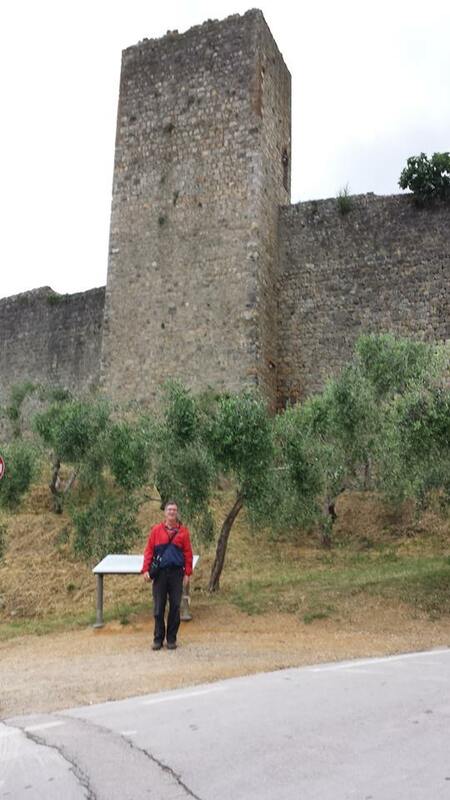 Finally we stopped at Monteriggioni, a hilltop fortress during the wars between Florence and Siena. It is quite a site, but rain moved in just as we arrived. We actually had very little rain on the trip, just one day in Paris, and thunder storms at night in Paris, and then at the end of this day. I think all the rain was in Minnesota. I looked around, took the wall walk, saw a church and hurried back to the bus. About all that was left of this day was dinner and bed. We picked up our Firenze Passes (Firenze is the Italian name for Florence). We have used City Passes in Chicago, London, and Paris and have one for Rome and the Vatican too. City Passes cover entrance fees and allow holders to by pass long lines. In the plaza outside the Uffizi there was an exceptional car show. They brought in sod to cover the cobblestone pavement, put the cars on stands, and each car had its own guard. 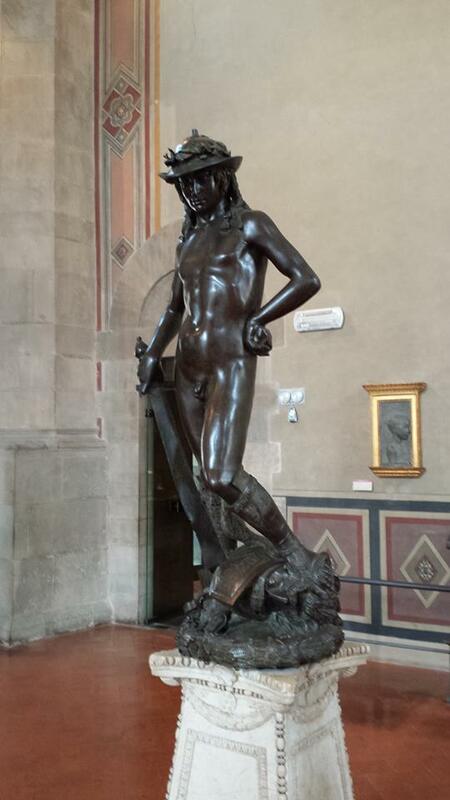 After lunch we stopped at the Bargello Museum, just because it was across the street and had some significant scuptures including some Davids that were precursors the Michaelangelo more famous versions. We took a little rest at the Hotel before taking the bus to the hills on the east and west sides of Florence. To the east is Fiesole. 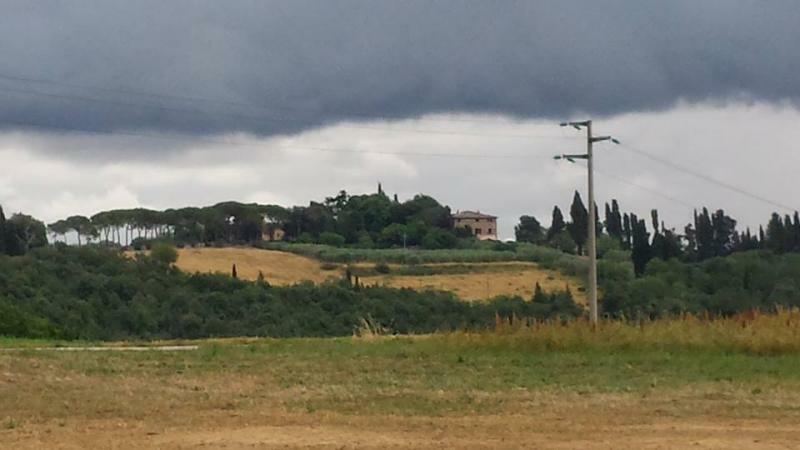 Its a little village with some Roman ruins and small churches. 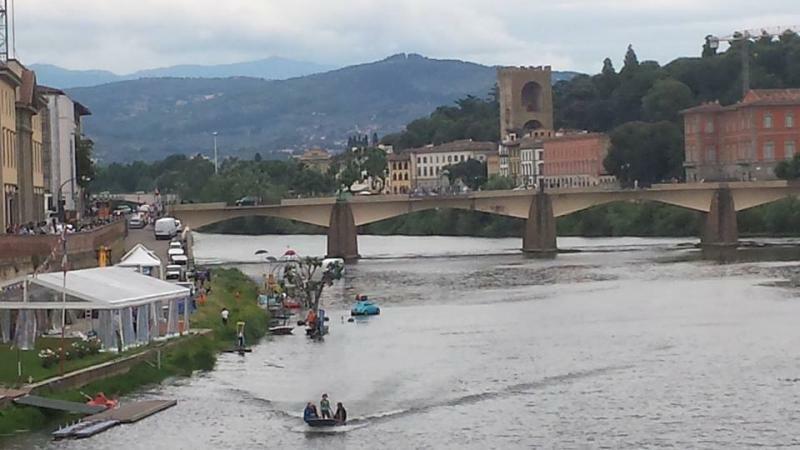 The view overlooking Florence was fantastic. Then we took the buss to the Plazza de Michaelangelo. The wealthy built their palaces up here to catch the cool summer breezes. Big day! Let me say it again, big day. The Museum of San Marco opened at 8:15 and the Accademia is across the street opening at 10 and both are just a few blocks from the Hotel. There are no crowds at San Marco. But there should be. San Marco is a monastery where Fra Angelico painted frescos in the monks cells. This one might look familiar since it is the wall paper on the screen of the computer in the balcony at Trinity. The next stop was the Accademia. By 10 the lines were already long with tour groups, but the Firenze Pass got us through a shorter line much more quickly. The main attraction is Michaelangelo's David, but there was also a nice musical instrument section, Michaelangelo's unfinished slaves and plenty of art. Next stop the Duomo, which is the big cathedral of Florence. It is free and though quite large and beautiful it does not take long to see. It is possibly most impressive from the outside. The Baptistry across the street is much more impressive with its gold hued ceiling telling the Biblical story and Christ overseeing it all. We stopped at a "fast food" restaurant, but more than just fast food it was good food fast. There were even chandeliers on the ceiling. The rest of the day we spent across the river because we were going to a concert of operatic Love Duets at St. Mark's Anglican at 9:15 that evening. The concert was beyond excellent! A soprano, bass and pianist sharing the most wonderful music for a hour and a half. We thought of Sophie the whole time wishing she was here. Thoroughly tired at the end of this day we hired a taxi and rode back to the Hotel. There was one more art exhibit I wanted to see at the Strozzi Palace. Jacopo Pontormo is a painter I have used a number of times in Bible studies. The exhibit actually was of Pontormo and an artist named Rossi exploring their divergent styles connected to religion and politics. It was good. That done we retrieved our luggage from the Hotel and headed to the train station. Since we wouldn't have lunch a couple Cannolis would do quite well. Buying a ticket was confusing though finally we got them and were on the train. It was fun to see the coutnryside. The train traveled at 250 KPH and when passing through tunnels the pressure on our ears was uncomfortable. Our introduction to Rome was not a happy one. We bought tickets for the train but became confused as to where the A Line train was, accidently got on the B Line which was very crowded and then discovered that someone had pickpocketed my phone. It happens. We did make it to the Hotel Modigliani and explained our misfortune. They were kind, expressing their sympathy by sending up a bottle of Proseco. After settling in and calming down a little we walked to the Bourghese Gardens. We rented bikes for an hour and rode around the rolling hills of the park. Getting hungry we wandered to the Spanish Steps and were invited in by the manager of the Ristorante Trinita De Monti. It was fabulous, from the welcome to the waiter to the food to the wine and the Limoncello as a gift from the manager. This was the first of two restaurants we stumbled upon that were among the best places I have ever been served and some of the finest food as well. We used Rick Steves' Pocket Guides in London and Paris and found it useful again in Rome as a way of exploring the city. The walk across Rome from the Spanish Steps to the Campo de' Fiori gave us a good cross section of Rome. Along the way we saw churches, fountains and monuments. I truly enjoyed simply entering churches along the way. They are holy, quiet spaces filled with art and beauty. We stopped at teh Basliica S. Andrea della Fratte, Santa Maria in Trivio, Santa Maria Aquiro, and San Luigi where I found the St. Matthew paintings by Carravaggio. The big monument along the way was the Pantheoon, which unlike the Pantheon in Paris is still a place of worship. The Pantheon is a magnificent structure built by the Romans around the year 120. Its single light source is an opening in the ceiling called the Oculus. In spite of the crowds it is relatively quiet and peaceful, full of art. We ended up at the Campo de' Fiori which is a large outdoor marketplace full of fresh food vendors. At the center is a statue of Giordano Bruno who in the late 1500's was a radical free thinker whose ideas would not surprise us but got him burned at the stake. After resting a bit back at the Hotel we walked down towards the Tiber River hoping to find a place to eat. Most of the restaurants were packed with fans of the World Cup watching soccer. We found a place called rHome which was fabulous. Once again we were welcomed warmly and served better than any place I can remember. When what I ordered was deemed not fresh enough to serve our waiter suggested and brought me a plate of Octopus. It was fresh, well prepared and I loved every bite. Yes, I shared some with Julie and she was equally amazed. Her motto for the trip has been "eat boldly," so we do. We also had Potato Crusted Sea Bass which was also excellent. Dinner lasted 2 hours, delightful with conversation, food and service. I plan to eat here again before we go home. 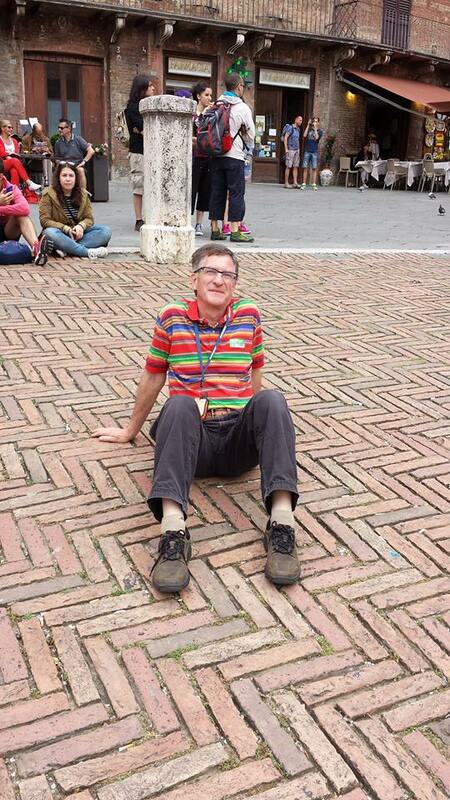 Rick Steves makes a comment about being patient with Italian inefficiency. Today started by testing my patience. We had an appointment to visit the Bourghese Gallery at 11 AM. First we had to pick up our Roma/Vatican Passes. The e-mail said I could pick it up at the train station so I walked over about 8:30 only to discover that at the train station I had to board a bus to go the Vatican to pick up the passes and then return to the Hotel so we could walk to the gallery all before 11. On the bus my patience was tested again by the chaos of traffic on Rome's streets. I would NEVER recommend anyone to drive a car in Rome. Amazingly I did make it back to Hotel before 11 and we were at the gallery by 11:15. And, the gallery was worth it! After a bland lunch we set off in search of some other Caravaggio's I knew were in a church near the Plazza del Popola. There were two churches one large and closed, the other small and open. It was in the small church that we found Caravaggio's Martyrdom of St. Peter and Conversion of St. Paul. We were strictly forbidden from taking pictures but I noticed a man standing next to me who smirked and glanced down at his wrist. I looked and he was taking pictures from his smart watch. I nearly started laughing. We spent the rest of the afternoon wandering trying to find the Villa Medici but every time we came up from the tunnels around the Spanish Steps and the Bourghese Gardens it was no where to be found we discovered we were going in circles. So we did the next best thing. We went back to the Hotel for a rest. I got us going around 5:45 to see a couple of churches before they closed at 7. Worship services were going on at both so we stopped at the Church of San Ignazio. Its a beautiful church with a painted dome ( they could not afford to build a real one) and a wonderful mural of Christ watching over the nations on the ceiling. ﻿﻿America seen as a still violent and uncivilized land. We were hungry for pizza and found a good place. I had a fried pizza and Julie had a ham and cheese pizza topped with greens. Of course we had a bottle of wine. On the way home we heard music in the Plaza San Silvestro. The Italian Navy Band was playing a concert. One of there ginal numbers was Volare and the whole crowd joined in on the chorus, or at least the first word, "Volare... Then went home and collapsed. ﻿﻿The Rome Colosseum is one of the big sites of Rome, and it is BIG! Architecturally and functionally it is the blueprint for every major athletic stadium ever built since then. A Plaza around the staduim, multiple entrances, an outer ring filled with food vendors, steep stairways leading to teh cheap seats at the top and to the expensive seats near the action, and very few bathrooms. (Actually the ancient Romans didn't worry about that, but then it seems neither do the modern Romans.) The biggest difference is that in modern stadiums when an athlete gets injured and there is blood the referees bring out the antiseptic and the trainers grab the first aid kits. In the Colosseum they cheered for more blood. We walked around the Palatine Hill and the Roman Forum looking at more ruins and getting a little Roman history. It truly is amazing to be walking around a buildings that are 2000 years old. It made me wonder what of anything we have built will survive 2000 years from now. Oh and we saw a lizard so I took a picture of it for Austin. It was a very hot day and we needed a break. A bus tour of the city provided the perfect opportunity. It was the same bus tour I had been on the day before, but this time I was more interested and less anxious. We returned to the Hotel for a little rest and then out to dinner. I had decided that since we only had two nights left we would revisit the two finiest restaurants I have ever visited. The first was Trinita De Monti where we were so welcomed and served. I wanted to go because the food was so good and as a way of saying thank you for being so good to us. And again we were greeted well. they remembered us and were glad to see us. Before we received the menus our waiter brought us glasses of Proseco. For starters we had clams on a half shell with bread crumbs, and assorted cheeses, pepper and honey. Main course, Julie had pasta with artichokes and I had Eggplant Paresan. We shared Panacote for dessert (ask Julie), and then Limoncello, of course. Wonderful! The Grand Finale of this journey was a visit to the Vatican, St. Peter's Basilica, The Vatican Museum and the Sistine Chapel. With the Omnia Passes in hand we are allowed to skip the lines to the Basilica. Enter and to the left is Michelangelo's Pieta, Mary holding Jesus after he has been taken down from the cross. It is magnificent and Michelangelo's grandest achievement. After the Basilica we exited to do a little shopping and find lunch. I was looking for a crucifix for my office and found many shops where everything in them "had been blessed by the Pope." Julie wanted to look at Nativity scenes. We found one very beautiful one but Mary, hand carved and hand painted, about the size of your hand was 500 Euros (about $600). Lunch was OK, but paying for our meal was "priceless." We went through a buffet type line, had our food, and stood at the cashier who informed us they did not take credit cards. We did not have much cash so he said we could go to the cash machine around the corner after we were done eating. So trusting, and of course we fulfilled their trust. After lunch we again skipped the lines and entered the Vatican Museum, which unfortunately was crowded, poorly laid out and crowded. There were some nice tapestries and a few paintings, but the whole goal of everyone it seemed was to get to the Sistine Chapel, Michelangelo's other great achievement. Truly every piece of Michelangelo's work in the Chapel was magnificent, but all together it was too much, and overcrowded. Yes we were tired and it was the end of the journey, but just the same stopping for gelatto one more time was more enjoyable than visiting the Vatican. For dinner we returned to the other most wonderful restaurant, rHome! We arrived at 7, but they didn't open till 7:30, so we hung out at one more church. I never got to much of he beautiful churches. When we did arrive back we were greeted like old friends. We wanted to order tuna but our friend the waiter came back from the kitchen and told us he couldn't face us and serve the tuna they had that evening. Instead we ordered Chateau Briand with Bernaise Sauce, (after we had spinach with bacon and shards of parmesan, and dried beef, fresh mozzarella and flatbread, along with a bottle of wine.) Then came dessert. Julie wanted to try Tiramaso, which we thought was a type of layered cake. Our waiter brought us cups, (he had brewed the espresso himself) with a cookie in the bottom soaked in espresso covered in whipped cream and chocolate. We nearly slipped under the table in ecstasy at the first bite. Then of course there was Vin Santo, a dessert wine and good-byes. I said good-bye to the manager who was sharing a meal with friends or family but he got up from his table and we thanked each other with what few words we shared in common. 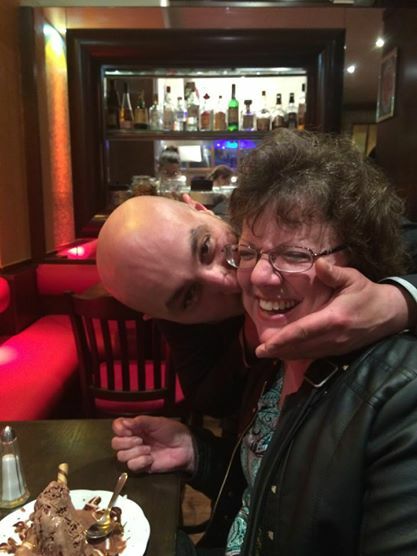 Our waiter gave Julie a kiss on her hand and I received the double face cheek embrace. Never have I felt so welcomed and appreciated just for dining at a restaurant. We were up in plenty of time and ready to fly home. We bought a bottle of Limoncello, a few bottles of Chianti Classico, and some chocolates. Mark and Linda Skinner met us at the airport in Minneapolis. 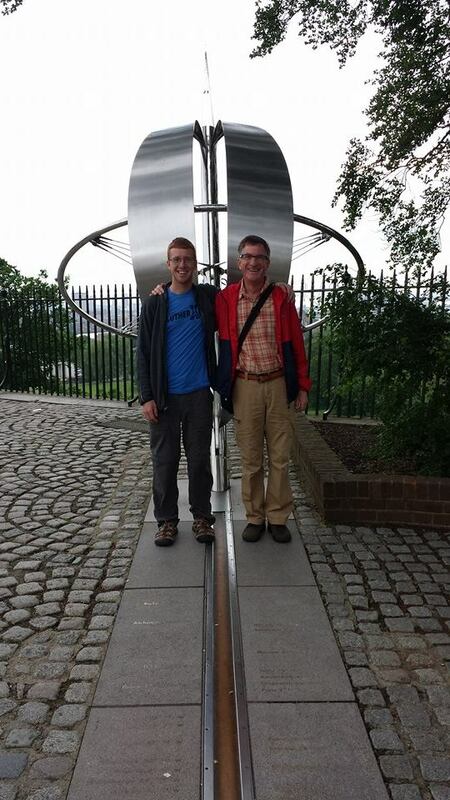 It took us a few weeks to get over jet lag, though we will never be done enying this journey. Twenty-five years ago Julie and I went on our honeymoon to Great Britain. We are still very much in love and love the opportunities we have had to travel. I am grateful to Trinity Lutheran Church of Milaca who supported and encouraged this whole process, to the Lily Endowment for Clergy Renewal, and my family with whom we enjoyed this time, the good which was very, and the bad and the ugly which happens. It is true, "Be it ever so humble there's no place like home," though "rHome" came pretty close. We have been back for a few days now. I will be sharing our journal entries and some photos from the trip as well as checking in here with other things I'm up to. I don't expect this column to be as interesting or exciting, but as long as I'm doing the other I'll check in here too. We are currently in Montana picking up Lydia and visiting Julie's parents, Audrey and Allan. I did get a little weeding in the garden done and have plenty left to do. I golfed and need some practice, ... again. We are recovering from jet lag, ... slowly. But we are home and that is good.